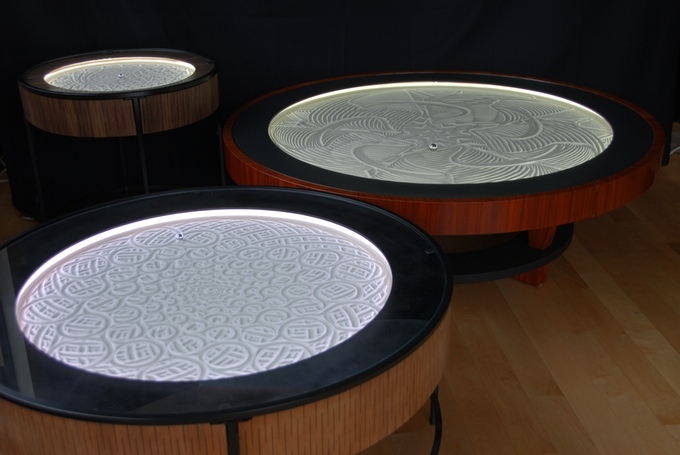 As a musical instrument plays songs, Sisyphus plays paths and creates stunning patterns in the Zen sand garden below the glass of a coffee table. Form meets function and kinetic art. Ever played with a Spirograph? If you have you’ll have experienced the anticipation and then the sheer magic of watching the patterns appear on the paper. And you’ll have had a foretaste of the Zen sand garden magic of Sisyphus, where kinetic art, technology and design merge into stunning, mesmerizing beauty for both marvel and meditation. The art table’s name comes from the Greek mythological king, Sisyphus, who was punished by being forced to roll a giant rock up and down a hill for all eternity. Likewise, beneath the glass of the table, Sisyphus rolls on forever, with a robot-powered magnet creating intricate designs in a thin layer of sand. Sisyphus is the creation of Bruce Shapiro of Minneapolis, MN, also known for his creation of the Eggbot. Obsessed with connecting computers to things that move, Bruce left his internal medicine practice twenty five years ago to devote himself to exploring motion control technology in art and education. He began teaching DIY Computer Numeric Control (CNC) and robotics at science museums, and creating large-scale, permanent installations in museums across the globe, including the Science Centre of Ontario, and the Science Center of Iowa, in Des Moines. At present, Bruce is the only composer for the Sisyphus paths, using a variety of vector-based programs with algorithmic approaches to create patterns. These are then converted by a simple utility to the file format required for Sisyphus to “play.” This utility will allow others using vector software to convert and apply their continuous line drawings from common vector formats, such as AI and DXF. The functioning art table is said to be extremely quiet. The ball being pulled through the sand by the magnet does make a sound, but it is described as “soft” and apparently not heard by most people when the table’s glass top is on. The stepper motors used in the end table and 3′ coffee table are driven by electronics specially designed to minimize noise. When playback speed is reasonably slow, the motors are supposed to be nearly silent. The faster Sisyphus is run, the more sound will be heard, so for those sensitive to noise, slower playback is recommended. The 4′ hardwood coffee table uses servo-motors, said to be quieter than steppers, and thus allow faster playback with minimal volume. While the exact number of paths that Sisyphus can play isn’t finalized yet, Bruce has said that it will be at least 25, with nearly all being algorithmic (the style he prefers). Some will cover the entire field with tight patterns, others will leave more space between the dunes. The time each path takes depends on its length, how fast you choose to play it, and how large your Sisyphus is. The result is that some paths take less than an hour to play, while others can take several hours. Unlike music playlists, when a new path or track is playing on the Sisyphus art table you also see the most recent paths, and perhaps even earlier ones if they haven’t been completely overwritten. The visual interplay between these tracks is said to sometimes bring some of the most beautiful surprises. The simplest track, which you can use to “erase” previous patterns, is just an even, tightly wound spiral, which takes about 5-10 minutes, depending on the size of the table. All paths designed for Sisyphus begin and end at either the center, or the periphery. This makes it easy to go from one design to the next in a playlist, since all tracks can be played forward or backward – the software automatically links the playback according to playlists you can create and edit. Sisyphus is available as a an end table, a 3′ coffee table (also in a custom hardwood version) and a hardwood 4′ coffee table. Be warned, some assembly is required! So far, more than 1,700 backers having pledged more than $1.7M on a modest $50,000 goal. Many of the lower reward levels are no longer available, but there are still pre-orders upwards of $800 that can be made before the campaign wraps up at the end of this weekend. If for any reason (like election season overload) you’ve decided that the time has come to draw a line in the sand to preserve your sanity, Sisyphus’s paths may offer just the way to Zen out and get your groove back. Just don’t be surprised if the “function” quickly fades when you quickly realize you’d rather not have anything covering up the artwork. I think the fact that they company is going to offer more than one size option is really going to be an upside! Looks like a very stable table! Yes, more than one size option is an excellent idea! Totally out of hand. But I cannot keep my eyes off it. For some reason, I am thinking that $800 is not that bad for a table like this! It would be an amazing conversation piece! I agree. The fact that I can get a smaller one for a sitting room is real nice. I like that! I could watch videos about this table for hours! I am not sure I would get anything else done if I had one of these in the house! Sooo on the same page with you, Janet! It’s a joy to watch!